The Los Angeles Rams were making their West Coast regular season debut as they hosted the Philadelphia Eagles on September 29, 1946. They were coming off of a NFL Championship the previous year as the Cleveland Rams, also their first year under Head Coach Adam Walsh, who installed the T-formation and put QB Bob Waterfield in charge of it with outstanding results. Despite the success, owner Dan Reeves lost money and chose to move the franchise to LA. There were newcomers in HB Tom Harmon, a former Heisman Trophy winner, as well as HB Kenny Washington and end Woody Stode, the first African-American players to appear in the NFL since 1933. The Eagles had gone 7-3 the previous year, barely missing the Eastern Division title, and one of their wins was against the Rams (the only defeat inflicted on them). Head Coach Earle “Greasy” Neale was assembling a good team that most notably featured HB Steve Van Buren and there were excellent linemen in MG Bucko Kilroy and tackles Al Wistert and Vic Sears. Philadelphia had added promising newcomers in halfbacks Bosh Pritchard and Russ Craft in addition to veteran C/LB Alex Wojciechowicz. There were 30,553 fans in attendance at the Memorial Coliseum on a hot day with temperatures in the nineties. The Rams scored first, putting together a 75-yard drive in the first quarter, with the biggest play a pass from Bob Waterfield to HB Jack Banta that covered 24 yards. FB Pat West ran the last two yards for a touchdown and Waterfield added the extra point. The Eagles responded with a 21-yard field goal by Roy Zimmerman to narrow the margin to 7-3. The Rams, moving effectively on the ground, reached the Philadelphia eight, but a holding penalty moved them back and a pass was intercepted by LB Ben Kish. The Eagles scored once more before the first quarter was over when Augie Lio booted a 42-yard field goal. Early in the second quarter, West (pictured at left) broke away for a 72-yard gain down the middle to the Philadelphia eight. From there, FB Mike Holovak scored a TD, Waterfield converted, and the score remained 14-6 at halftime. The Eagles started off the third quarter with a drive that resulted in Zimmerman kicking a 19-yard field goal to narrow the score to 14-9. The Rams lost Waterfield, who completed 6 of 9 passes in the first half, due to a rib injury suffered when hit hard by Bucko Kilroy while passing, and he played sparingly for the remainder of the contest. The Rams bogged down on offense as Jim Hardy and Kenny Washington, normally a halfback but being given a trial at quarterback, took turns behind center. 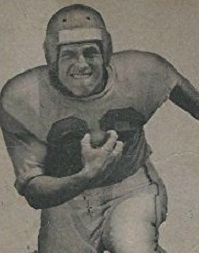 Philadelphia was on the move later in the period, and following a 24-yard run by Russ Craft, QB Allie Sherman (pictured at top) passed to end Larry Cabrelli for a 38-yard touchdown. Zimmerman added the extra point to put the Eagles ahead by 16-14. Early in the fourth quarter, and following a turnover in which G Duke Maronic hit Holovak behind the line and grabbed the ball away from him, the visitors struck again. Sherman threw for another TD two plays later, this time to end Jack Ferrante that covered 28 yards, and Zimmerman’s point after put the Eagles ahead by nine points. Midway through the final period, Waterfield re-entered the contest and completed a pass to end Steve Pritko but, after Holovak ran the ball down to the Philadelphia 20, the Rams came up empty. It proved to be their last gasp. The Eagles picked up two more points when Washington, attempting to pass from his own end zone, stepped out of bounds for a safety, and that was it. Philadelphia dominated the second half and came away with a 25-14 win. The Eagles led in total yards (316 to 233) as well as first downs (16 to 15), topping Los Angeles both in rushing (141 to 116) and through the air (175 to 117). The Rams turned the ball over four times, to two suffered by Philadelphia, but the Eagles were penalized nine times, with six flags thrown on LA. Allie Sherman was the most productive passer for the Eagles, hitting on 7 of 11 throws for 113 yards and two touchdowns while giving up no interceptions. Steve Van Buren, who had a quiet day running the ball from scrimmage with 33 yards, contributed kickoff returns of 54 and 46 yards. For the Rams, Bob Waterfield ended up completing 7 of 13 passes for 78 yards with two intercepted. Jim Hardy was 2 of 12 for 23 yards and an interception and Kenny Washington completed just one of seven for 16 yards. Pat West, who left the game due to injury shortly after his long scoring carry, gained 83 yards on five rushing attempts that included a TD. 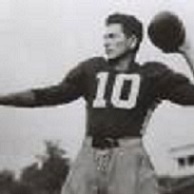 As for Tom Harmon, he had a quiet debut, being held to negative yardage on three carries. The Eagles won their next game before losing two and they ended up with a 6-5 record to place second in the Eastern Division. Los Angeles followed up with two wins and a tie on the way to going 6-4-1 and finishing second in the Western Division. Allie Sherman, the future head coach of the New York Giants, was typically a backup and, for the year, ended up completing 17 of 33 passes for 264 yards and four touchdowns while giving up three interceptions. Bob Waterfield recovered to lead the NFL in pass attempts (251), completions (127), and TD passes (17, tied with Sid Luckman of the Bears) and, for good measure, in extra points (37). He received first-team All-NFL honors from the Associated Press and UPI.